All killer, no filler. The Slayer is a full-on enduro missile. With a pedigree of success on the most aggressive Enduro World Series tracks, the all-carbon Slayer’s descending aptitude and uncanny ability to hold speed in rugged terrain are matched with surprising pedalling efficiency. Predictable and capable, its rate curve provides good support at sag and a moderate ramp towards the end-stroke—perfect for sending bike park laps and big mountain lines. The RIDE-4™ adjustment system allows riders to quickly fine-tune their geometry with a pair of Allen keys. Four configurations are possible thanks to one rotating chip. This allows for subtle geometry changes with minimal effect on your shock tune. Geometry setup is a complex art form with huge variables in rider style, preference, terrain, and ability. Smoothlink™ suspension is efficient yet supple when you’re on the pedals and across a wide range of gears. It features a controlled end-stroke and a rate-curve that feels more capable than the travel would suggest. This four-bar suspension design philosophy is centred on ride characteristics; each bike platform we develop balances variables like anti-squat, axle path, chain growth, rate curve, anti-rise, etc. 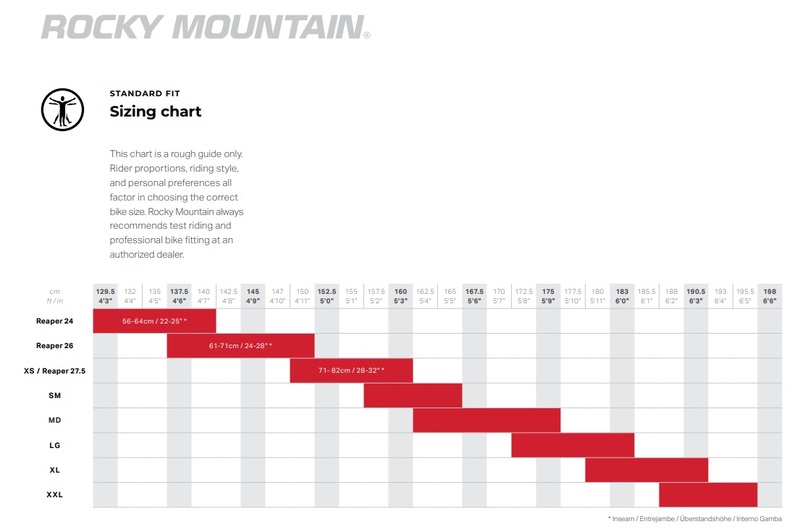 to achieve the legendary Rocky Mountain ride feel. Smoothwall™ carbon uses one of the world’s most sophisticated carbon processes to deliver industry-leading stiffness-to-weight, ride quality, and durability. We eliminate excess resin and fibres by using rigid internal moulds instead of traditional air bladders. We then utilize different types of carbon in specific frame areas to maximize stiffness and impact resistance while minimizing overall weight. FRAME SMOOTHWALL™ Carbon. Full Sealed Cartridge Bearings. Press Fit BB. Internal Cable Routing. RIDE-4™ Adjustable Geometry.